In parts 1 and 2 of this series, we’ve coded up a simple .NET Core 2 web application, containing some services, and we’ve dockerised it and its stored on our local docker image library. Cool. Now, what happens if we want to be able to share that unit of execution with other members of a team, so they can test changes…..we do that using docker repositories. I wanted to try and simulate a more “secure” method of storing images to be shared within a team, so I created my own repository, I didn’t want to use the public docker hub. I also didn’t want to use a docker repository hosted on the cloud. Thats easy, but costs some money. I wanted to do it on the cheap. I had a spare raspberry pi hanging around so lets use that as a starter for ten! Step 1. Install raspbian. Its easy enough to find tutorials to do that on the ‘net. Step 2. Install docker. 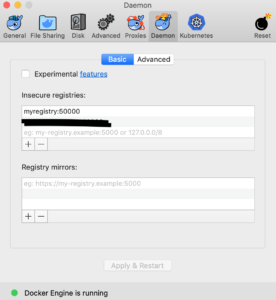 Here I used: https://forum.hilscher.com/Thread-Setup-trusted-Docker-registry-on-a-Raspberry-Pi-to-host-netPI-containers. I’ll go through each of the commands one by one…. 2c. Obtain a certificate that can protect the docker repo. Now this bit isn’t required, but if we want to integrate with Azure DevOps down the line, we’re going to need to make sure that we’ve got a “secure” repo. I got my certificate from https://sslforfree.com, it’ll expire in 90 days but for the purpose of this tutorial it’ll do nicely. Make sure the “common name” matches with the hostname you’re going to call your registry. --restart=always …restarts the container after a reboot. -v /var/lib/docker/certs:/certs …mounts a folder inside the container called certs to a folder on the docker host where we’ve stored the certificates. -e REGISTRY_HTTP_ADDR=0.0.0.0:443 ….sets an environment variable the docker registry image understands to set what IP addresses to bind the http daemon to. docker hub that this registry will be based on. …this little bit of JSON shows that this repository has no images currently in it. So we now have a working repo, what do we do on our docker client to be able to push to it? Step 3. Make Docker Client aware of our Docker Repo. docker build -t monolithsvc . Step 5. If that’s all worked then we do a docker push…. if all is successful we should see all the layers uploading to our registry! Next time, we start integrating with Azure DevOps and get the test driven development moving….